Many years ago, when I worked as a staff nurse in a busy (what other kind is there?) A&E unit, it would sometimes be necessary to assess a patient’s level of attention following certain types of trauma. One of the ways of doing this was to get the patient to count down from 100 in 7s – the so-called serial-7. It always struck me that the task did not provide much information without knowing the patient’s normal ability to perform the task. A reasonably efficient method may involve skills in partitioning and subtraction. Many people will say very quickly ‘100, 93’ – the year 11 set 2 and 3 students I asked this morning did, anyway. Then there are problems. Subtracting 7 from 93 efficiently may involve partitioning 7 into 3 and 4, subtracting the 3 then subtracting the 4, to give 86. Then partition the 7 again, this time into 6 and 1. 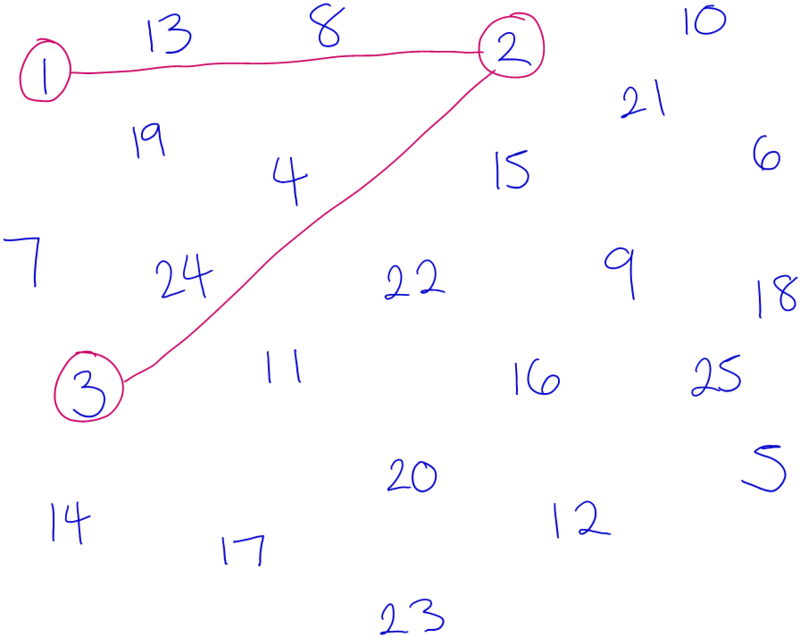 Closely related to this method is recognising that subtracting 7 is equivalent to subtracting 10 then adding 3. These processes are complicated and a person with some attention deficit but good mental arithmetic skills may well do better than another with no attention deficit but poor mental skills. If this test gives results which are almost impossible to interpret, then why is it so widespread in its use? My guess is that it was probably invented by a doctor for whom these methods were natural and simple, and who made the classic (non-teacher’s) error of assuming that everyone is as competent as they are. Another task given to patients was the ‘trail test’. In this test, numbers from 1 to 25 are written randomly on a page and the patient is asked to start with a pencil on 1, draw a line to 2, then 3,… The time taken to reach 25 is noted and this is converted into a medical assessment. My score was just over 30 seconds and consistent with a mild degree of impairment. I like to think that this was more to do with the fact that it was in the middle of night duty and therefore didn’t reflect my normal brain activity! The ‘trail test’ involves very different skills – related to the ability to take in a large amount of information (the position of the numbers on a page) quickly and accurately and the ability to remember where the numbers are while moving from one to another. By the way, when teaching correlation, you may like to give every student a trail test and a word-search test. The times taken for successful completion provide bivariate data which show surprising correlations! Very high scores probably depend on good memory. As you probably realise by now, we’re talking about mental methods in mathematics. I’d like to suggest that these skills are important (not just because you might end up in A&E one day!) and that they’re very complicated, so their acquisition by the student can’t be left to chance. The key to students’ development of these skills is the recognition by the teacher that these ideas can be taught successfully. Between now and the next time I write, talk to your students about subtraction using partitioning – or for that matter any other mental method – and get them to count down from a given number, in steps of something easy at first, 2 or 3 or 5, maybe, then getting harder. Do this at least twice a week but for no more than five minutes each time – you’ll notice a difference in their ability surprisingly quickly. John Rayneau , BSc MSc RGN CertEd, is the lead practitioner in maths at a school in Oxford. John’s articles draw from his experiences in mathematics education and nursing – as well as being inspired by the absurdities of school life.